Former BBC boxing commentator Harry Carpenter has died at the age of 84. Carpenter was the BBC's voice of boxing for almost half a century after joining the corporation in 1949, when he first began commentating on the sport. 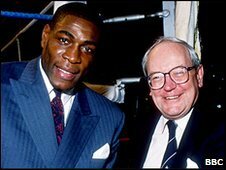 Known for his double act with British boxing great Frank Bruno, Carpenter also presented Sportsnight, Grandstand and Sports Personality of the Year. He retired in 1994 and died in his sleep at King's College Hospital in London in the early hours of Saturday. His lawyer David Wills said: "He had been unwell since last summer when he had a minor heart attack. "The funeral has not been arranged but will be a family funeral, to be followed by a memorial service in London." Carpenter became closely identified with Frank Bruno, whose catchphrase "Know what I mean, 'arry?" featured in their post-fight interviews. The former world heavyweight champion, 48, was said to be "very upset and shocked" by the death. "He [Carpenter] was obviously part of Frank's up-and-coming career from the early days when Harry used to commentate, particularly at the Royal Albert Hall, on Frank's boxing," said a spokesman for Bruno. "Then they became a bit of a double act with the 'Know what I mean, 'arry' thing. From there they went on to do appearances together almost like a little cabaret act." He also referred to the moment during Bruno's world-title fight against Mike Tyson in 1989 - which the American won - when Carpenter forgot his impartiality for a moment and cried out: "Get in there, Frank." "The most exciting time was probably the Tyson fight when even Harry Carpenter, who was quite a cool man, sort of lost his cool," the spokesman added. Former world heavyweight champion George Foreman, who took part in the "Rumble in the Jungle" with Muhammad Ali in 1974 - which Carpenter covered - said the commentator brought style to the sport. "We all knew if there was going to be some class in boxing, someone who really brought out boxing and the human being probably, it would be Harry - great Harry," Foreman told BBC Radio 5 live. "We were all accustomed to boxing people bustling in and arguing. but Harry was a real classy human being. "Always a good smile, sticking right to the point as though he wanted to give the public a bird's-eye view of the human being and of the boxer." Former world heavyweight title challenger Sir Henry Cooper said Carpenter was "a lovely guy" who was "never flash". He added: "If you were good then he'd give you a good write-up and if not, he told you one or two truths. "I always enjoyed his company and enjoyed talking to him. And he knew the game." Promoter Frank Maloney also paid tribute to Carpenter, describing him as "probably one of the greatest commentators of all time". He added: "His voice was so distinctive and I remember all those Ali fights and Bruno fights he commentated on. "It's like a piece of boxing history has been taken away." And former world light-heavyweight champion John Conteh said Carpenter had an "outstanding passion" for boxing. "We in this sport, including people like Muhammad Ali, can intuitively tell when someone loves boxing - and he was steeped in it," added Conteh. "I remember watching and listening back to some of my fights that he commentated on and there was always constructive, not destructive, criticism from him." Former world featherweight champion Barry McGuigan also paid tribute to Carpenter, telling BBC Radio 5 live: "This guy was a legend. Harry Carpenter was an amazing man with an amazing voice." 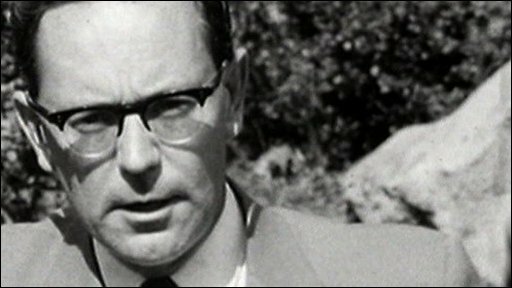 Carpenter worked for the Greyhound Express and Daily Mail in the early years of his career before joining the BBC. He commentated on major sporting events including Wimbledon and the Boat Race. But it was as the public face - and voice - of the corporation's boxing coverage that he became best known. One of his best-known pieces of commentary was at the end of the Rumble in the Jungle. He labelled the end of the contest in Zaire (now the Democratic Republic of Congo), which underdog Ali won by knockout in the eighth round to reclaim the world heavyweight crown at the age of 32 - as "the most extraordinary few seconds that I have ever seen in a boxing ring". Of Ali himself, Carpenter said: "He is not only the most remarkable sports personality I have ever met, he is the most remarkable man I have ever met." Carpenter also had the privilege of presenting Ali with the BBC's Sports Personality of the Century award in 1999. A year later, Carpenter recalled: "It was a wonderfully poignant moment. I was very flattered and pleased that I was asked to do the tribute to him. "It was such a shame to see the old boy tottering about, but we had a chat afterwards and he is still very, very sharp. He remembers all those old days." Carpenter was a regular Sports Personality of the Year co-host throughout the 1970s and 1980s, having first worked on the programme in 1958, and also covered a wide range of sports for the BBC, including rowing, tennis and golf. His immediately recognisable, warm broadcasting style earned him plaudits outside the United Kingdom, too. In 1989, he received American Sportscasters' Association and International Sportscaster of the Year awards. Director of BBC Sport Barbara Slater also paid tribute to Carpenter, describing him as "one of the standout voices of sports broadcasting". She said: "Harry's passing is a huge loss to the world of sports broadcasting. His journalistic credentials, professionalism and presence marked him out as an inspirational figure for a generation of aspiring presenters, commentators and producers. "He will be sorely missed by all those who had the good fortune to work with and learn from a master." Presenter Des Lynam added: "Harry never yelled or screamed - he was a great wordsmith. "He was modest, humble and never starstruck. He travelled to Television Centre by tube. "He will be very missed." Tony Jeffries, Britain's light-heavyweight bronze medallist at the Beijing Olympics in 2008, said: "He was a brilliant man and his knowledge of boxing was second to none." Andformer GB Boxing coach Terry Edwards said Carpenter and fellow commentator Reg Gutteridge, who died in January 2009, were "monumental people" in the sport. 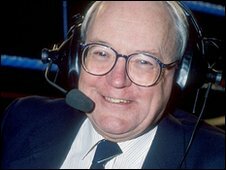 He stated: "Their commentary was so great, detailed and passionate that you remember their voices as much as you remember the bout. "If you were to ask me now who would take Carpenter's place, there is nobody who could truly take his place - not with the same passion and professionalism."